I have hosted visits from authors Cambria Evans (2009), Jeffrey Bennett (2009), and Zetta Elliott (2013). During these visits, the authors presented their work to students, shared stories, and gave "behind the scenes" information about how their books were written and published. Bridget Taylor sharing one of her books. Authors Read Aloud was a program run by Learning Leaders. 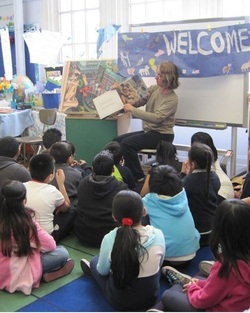 The program brought authors to schools to serve as mentors to students over the course of several visits. During the 2009-2010 school year, my library was selected to host Sheila Solomon Klass, Ann Seidler, and illustrator Bridget Taylor. They each "adopted" classes in the 2nd, 3rd, and 4th grades and shared their experiences, knowledge, and advice.